Assessing your vulnerability to risk is a relatively quick and simple process. Determining how to build resilience into your lifestyle so you can either reduce the risk or lessen its impact, is a little trickier. The topsy-turvy economy has got me thinking about the potential risks to my financial well-being. A lot. One of the key risks to our financial well-being is how we earn a living. So, one of the key areas I’ve been debating is: Should I return to the corporate world in a 9 to 5 job or continue to be self-employed? That then raises the question: If I’m working a corporate job and commuting roughly three hours a day, will I still have the time (or energy) to work on my side projects? Which is the riskier way to earn a living? Which makes me more vulnerable to risks outside my control, a regular pay cheque or self determination? These are the questions that have been dogging me lately. I think I’ve resolved them. Time will tell. For those of you still struggling with similar questions, this post might help. What are the potential risks to your financial well-being? The economic environment in which we live is completely and utterly beyond our control. We cannot change the economic environment but we can change the way in which we’re affected by it. Can you recession proof your life? If the company you work for decides to downsize in order to show their shareholders a profit, your job could be gone. What then? Here’s a timely example. I just heard that eight of my former colleagues lost their jobs – today. No warning. Just, sorry… we no longer need your services. What would you do in that situation? If you are lucky enough to have a home of your own, whether or not you carry a serviceable mortgage, what happens when general wear and tear over time brings about the need for a major repair job; like replacing the roof? Do you have the money to get it done? Do you even know how much it would cost? If you’re renting and the landlord decides to sell; do you have the resources to move in a hurry? We’re already seeing ongoing rises in electricity prices. At what point will using electricity to keep you warm or cool become a luxury you can’t afford? What about the cost of a long commute by car? What can you do to reduce your reliance on utilities? Even in a country with universal healthcare like Australia, a major health crisis can spell financial disaster. While most hospital costs will be covered for public patients there are still costs for pharmaceuticals, tests performed outside the hospital and general costs not covered by Medicare that need to be taken care of. Even if you have private health insurance, you will still have out of pocket expenses. What’s not covered at all, is your income. If you’re unable to work for a month or two and you have insufficient leave to cover that time, what will you do for income? These are just some of the big picture issues that we all face. I guess you could say these are the big rocks that we need to deal with first. As you begin to ponder these issues, I’m sure you’ll be able to fill in the specifics with details from your own experience and add some colour from your own lifestyle. At first they might just seem like headlines but as you place them into the context of your own life they will become personal. Sometimes, we need to have a deeper understanding of the risks to our financial well-being before we can begin to change our mindset and behaviour. Once you understand these risks on a truly personal level, you will naturally increase your sense of urgency when it comes to paying down debt, building an emergency fund and finding additional ways of bringing in extra money. Try running these scenarios to see how you and your family would manage. Multiple Income Streams – When your income is created and received in a variety of ways, from a variety of sources you’re protected from the potential devastation of a job loss. Think about different ways you can earn extra money either by starting a business, getting a part-time job or turning a hobby into a cash earner. Emergency Fund – The name speaks for itself. If you have money stashed away for a rainy day you give yourself time to look for the best solution when something goes wrong. If you don’t have an emergency fund yet, start one now. Make it a priority. Maintain your Assets – Look after not just the things you own but the health of you and your family because it, too is an asset. Your health is the main asset you rely on for everything in life, like earning a living as well as looking after your family. Make sure your home, vehicle and tools of the trade are in good condition. When regular maintenance is neglected, things start to break down. It’s probably impossible to completely remove all risks to your financial well-being but you can manage them, once you know what they are. 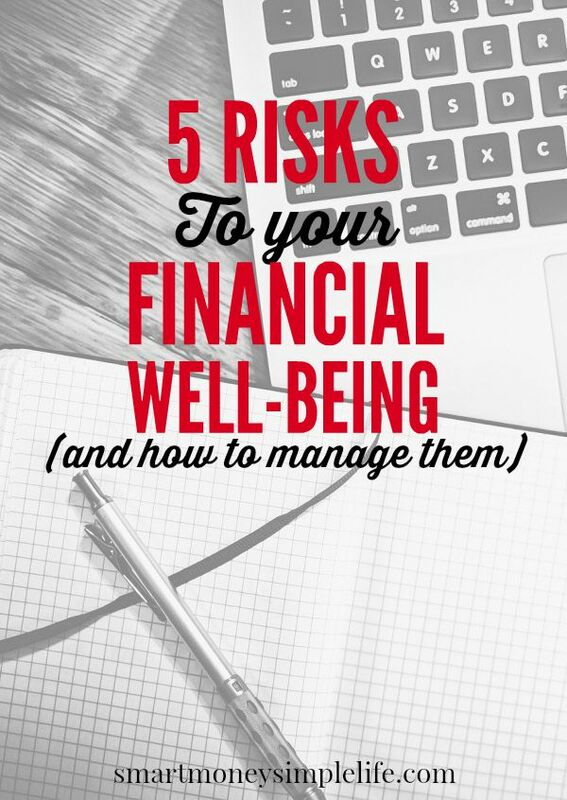 What specific risks to your general financial well-being can you see? It might be a risk to the industry in which you work? Or even your local economy? Once you’ve determine a risk, see if there are some simple actions you can take to minimise that risk. My work has been restructuring since the beginning of the year and while I’ve been lucky to still be there, a lot weren’t. Unemployment has been constantly in my mind the past few months, although I have a decent amount of emergency fund that will support me for months in case it happens, I don’t like the idea of losing a job (and the difficulty of finding another one). I’m trying to live my life as usual but these days, I think twice about spending on things I don’t urgently need. I think that’s the best thing I can do for now. It’s definitely getting even more interesting with the stock market bouncing all over the place. Fingers crossed your job remains secure! What a simple, straight-forward post! It’s easy to put these in the back of our minds but so stressful if and when they DO come up. Better be ready for them and not be sitting ducks! Thanks Jaymee! Yes, a little bit of planning can save a whole boat load of stress.